Is there anybody alive out there? | Better days! I am a new Bruce Springsteen fan who lives in a country where he is virtually unknown. This blog is a quest to communicate with people who really understand what an amazing impact his lyrics and music can have on a person’s life. Love your blog! I am in America, not too far from where Bruce is from. I grew up with his music, thanks to my dad, who was once lucky enough to help set up gear for Bruce when he was very young and still doing shows at universities! What a privilege! Thanks for dropping by! Thank you for saying hello from South Africa on my blog earlier today. I reciprocate by visiting your WordPress blog. I like seeing your expressions for Bruce and for your beautiful country. We have never been to South Africa but I have trained au pairs from South Africa in a Sunday morning class, Office 2000 course at the University of Connecticut, in Stamford Ct. They had a wonderful command of English and shared with me how easy English was for them to learn and communicate. Its great to extend the community of Bruce Springsteen from Milford, Ct. USA to South Africa. I will subscribe to your blog so I can stay informed from your corner of our planet. Thanks for dropping in! Yes, it is great how music (and especially Bruce’s music) can bring people together. I love the banner – the photos really seem to convey the essence of their relationship. And after so many years it is still relevant. Just a quick thank you for tagging my blog in yours, i’ve been reading some of your stuff and i dig it. i hope bruce one day comes to south africa for ya! If he does, I really hope Patti comes with, would love to see them do one of their duets. Nice to find some bruce fans in sa. We can still live in hope here at the cape. Eagles were not bad but fear bruce does not have enough fans down here. Had to get new the album online since it was unavailable here. Yes, we are indeed a rare species here! Welcome to the club! And yes, one can always hope … but I don’t thinks chances are good for us. It is very possible Springsteen will be coming to South Africa in 2013, probably in April, on his way to Australia. I have heard from a good source that big concerts are currently negotiating with his people. New dates are being released daily on his website. I have traveled far and wide to see him. First time was in Boston, then Washington DC and this year i saw him in Manchester. Every concert and experience was incredible. Springsteen fans in Boston were truly amazing warm people. To be at an American concert with every single person singing along to every word and dancing in complete unison made me feel that I was part of something great. Being a South African and feeling like the only person in the country who knows who Springsteen is, has always made me feel like a loner in my music taste, but that all changed once I joined in the revelry of his live concerts. I am just worried that if he does come to South Africa, I will look like a complete berk performing all the concert moves that I have learned over the years. 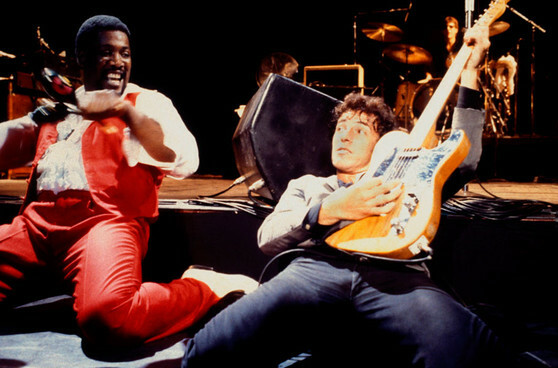 We will have to fill the stadium with hardened Springsteen fans and teach our countrymen how its done. Glad to have found another ardent Springsteen fanatic. I left a reply in your book section, but I’ll speak to you more directly here, since this seems to be more or less your direct contact. I wrote a book last year that involves Bruce Springsteen. It’s actually about the story that inspired the album Nebraska: The Starkweather/Fugate case in 1958. One of the chapters is all about the music and movies that the story inspired, including the Nebraska album. There’s one wonderful story about how he pursued the author of Caril and tried to get her to be a fan of his music because he loved her book so much, he wanted her to like his music also. She was, alas, more of a fan of big band music, but he nevertheless kept trying to get her to like him, sending her his albums, tickets to his concert, etc. He even stopped his concert at one point and had the spotlight put on her and told everyone to buy her book because it was so good. They became good friends. I too love the Boss, and am so very happy that he has a fan in Africa! !